My friend Greg joined me to see Wilco last night at Sloss Furnaces. I'd been to Sloss for the haunted house and other events, but this was the first time I'd seen a concert at there, and I thought it was pretty cool. The train runs right next to Sloss, and one passed by blowing its horn during the show. Neither the band nor the crowd seemed to mind -- in fact, it added character to the venue, as did the legendary haunting of Sloss Furnaces mentioned several times by the band. I was really tired during the show (which made me feel old), and I kept thinking to myself, "Just one more song..." I ended up staying for the whole thing though, and I'm glad I did. Wilco put on a great performance. Even though I've been listening to them since the mid-'90s, it was the first time I'd seen them live. 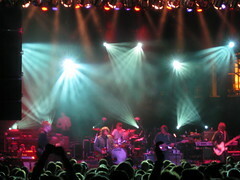 You can read a full synopsis of Wilco's concert in my Get On With Your Nightlife blog.